The survey, released by global accounting body CPA Australia, shows that 89 per cent of small businesses reported growing during the last 12 months and 94 per cent expect to grow in the next 12 months. 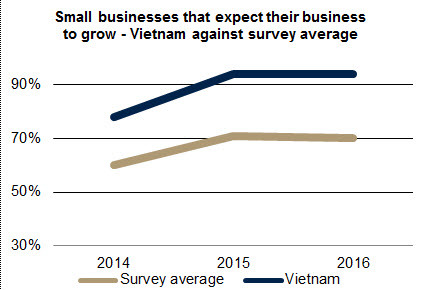 The results also show that 86 per cent of small businesses expect the local Vietnamese economy to grow in the next 12 months. These very strong figures rank Vietnam second behind only Indonesia of the eight markets surveyed and ahead of Malaysia, China, Hong Kong, Singapore, New Zealand and Australia. CPA Australia chief executive, Alex Malley said small businesses in Vietnam had a strong focus on the drivers for growth. “The Vietnamese economy is growing and small business in Vietnam is increasingly part of that growth story,” he said. The reported growth and confidence is also reflected in employment figures with 54 per cent of small businesses saying they have increased employee numbers in the past year and a considerable 71 per cent expecting to increase employee numbers in the next 12 months. “There is extraordinary potential for small business in Vietnam and I expect that we will see continued growth. It is possible that some of these businesses might grow into the large multinationals of the future,” Mr Malley said. Vietnam also performed well in terms of embracing the opportunities of the digital economy with 86 per cent of respondents earning revenue from online sales and 92 per cent of respondents using social media for business purposes. The survey also showed an increase in the number of small businesses that expect to introduce a new product, service or process with 31 per cent of businesses reporting this as their intention, up from 26 per cent in the previous survey. “Given the importance of small business to Vietnam’s economy, the Government’s policy settings are providing the environment needed for small business to thrive,” Mr Malley said. The CPA Australia Asia-Pacific Small Business survey provides annual insights into the views of small businesses and is conducted across eight markets in the region. This is the seventh year the research has been conducted.